This SuperSpeed USB 3.0 secure flash drive is the ultimate data storage solution for high data security organizations. 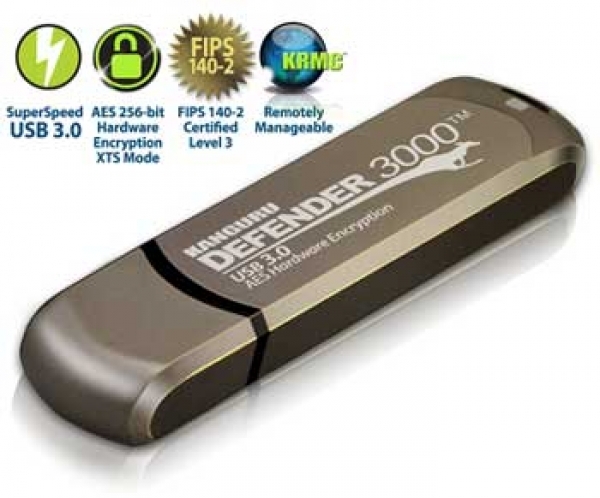 The Kanguru Defender 3000 is an AES 256-bit hardware encrypted USB 3.0 flash drive boasting XTS Mode Encryption, FIPS 140-2 Level 3 certification, and remote management capabilities. The Defender 3000 complies with the Trade Agreements Act (TAA Compliance), making it an outstanding USB drive for the highest security environments, including government, healthcare and financial industries. Well beyond just simple password protection, this SuperSpeed USB 3.0 hardware encrypted XTS Mode drive offers on-board Anti-Virus, brute-force protection, waterproof / tamper-proof casing, and a solid tactile finish that make it an impressive USB device to meet the most rigorous data security needs and requirements. The Defender 3000 is easy to use, works on most OS platforms, and can be remotely managed along with other secure USB devices anywhere in the world. Furthermore, all Kanguru Defender USB drives are fully protected from potential risk of 'BadUSB' malware tampering with digitally-signed, RSA-2048 secure firmware.